Updated Wednesday March 6, 2019 by Brandy Balsman. A-The Perryville Optimist Soccer League (POSL) offers two seasons, spring and fall. Q-When does registration open for the season? A-Spring registration usually opens up the first week of January and runs through the first week of February. Fall registration usually opens up the first week of June and runs through the second week of July. Q-How do I register my child? A-The best way to register (for yourself and the volunteers in the organization) is to register on our website, www.PerryvilleSoccer.org. A-Pre-k & Kindergarten registration fee is $30. 1st grade through 8th grade is $40. Q-Is there a late fee if I miss the deadline? A-There will be a registration deadline. Following the deadline you may place your child's name on a waiting list by emailing the league president and following the directions for the waiting list. If there is room for your child on a team prior to practices starting, you will be notified by the coach. Waiting list players will incur a late fee that will be added to the registration fee. Q-When will I know my child's coach? A-The POSL board holds a meeting (generally three weeks prior to the start of the season) to organize the divisions and designate the coaches of each team in each division. The process follows as so: Coaches will be contacted by a board member who is their Division Coordinator for that season. Coaches will then be asked to attend a meeting which is scheduled within a few days of the board's meeting. Coaches will form their teams at that meeting. Coaches are instructed to contact their players as soon as possible. The new online system has a notification that will go out once each player is placed on a roster in the system. This will notify the account holder of the name of the team as well as the coaches information. A-At the coach meeting prior to the start of the season, coaches are able to sign their team up for a night of the week that their team will practice. 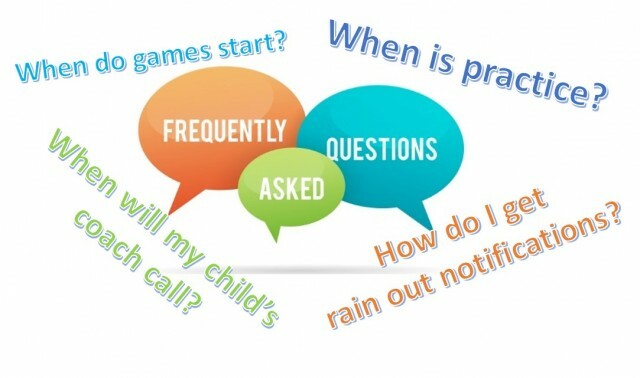 Coaches are asked to inform parents through the initial phone call of when and where the team will practice. A-The Pre-K and Kindergarten divisions have games scheduled on Wednesdays and Saturdays. Games for 1st/2nd, 3rd/4th and 5th/6th will be scheduled to play on Tuesdays, Thursdays and Saturdays. The 7/8 division will play on Sunday afternoons, Wednesday and Mondays. Monday evenings may also be used across other divisions, if needed. A-Game Durations: Pre-K -- (4) 8 minute quarters with 2-3 min breaks or (2) 16 minute halves, K – (2) 16 minute halves, 1st/2nd grade – (2) 20 minute halves, 3rd/4th grade - (2) 25 minute halves, 5th/6th grade– (2) 30 minute halves, 7th/8th grade – (2) 30 minute halves. Halftime Breaks will be 5 min. Q-How long are the seasons? A-Typically the seasons run about 6-8 weeks depending on various factors including rainouts and make-ups, holiday weekends, school, etc. Spring season starts in the beginning of March and Fall starts mid August, typically following the start of school. Q-How many games will my child play? A-Each team will have a minimum of 7 games scheduled. Q-How will rainout games be determined? A-The POSL board works together to determine whether or not games should be played. Many factors are considered including the safety of the children, spectators, coaches and referees, the condition of the fields, the availability of make-up slots, etc. The POSL board has elected that a decision shall be determined by 3:00 p.m. A message will be posted on our website, our Facebook page and a text and/or email will be sent to those that have an account through our website. Lightning will automatically cancel a game and no games will play within 30 minutes of seeing lightning. It has been advised to the referees that if rain starts during a game, everyone may leave the field and wait in their cars for 15 minutes to see if conditions improve and wait on a decision from the POSL board. Q-Will rainout games be rescheduled? A-Yes. We do our best to have revised schedules out as soon as possible following the rain outs. Q-What is the best way to get notifications and information from the POSL? A-In order to receive notifications from the POSL, create an account on our website, www.PerryvilleSoccer.org. There are instuctions available here http://perryvillesoccer.org/site/ClientSite/article/1047275 on how to set up your phone to receive text alerts. Q-What field(s) will my child play on? A-The Pre-K division typically plays on the FIeld 10, Kueker, and/or Mid-America Rehab/Perryville Family Care Clinic which are split into two fields for each game. Kindergarten plays on the RE/MAX Realty Experts and Winkler Plumbing & Heating Fields, unless otherwise noted. The 1st and 2nd grade coed divisions play on the Field 7 and TG Missouri fields, unless otherwise noted. The 1st and 2nd grade girls division plays on the Richardet Floor covering field. The 3rd and 4th grade coed division plays on the Field 10 and Kueker Landscaping fields. 3rd and 4th grade girls play on the Mid-America Rehab/Perryville Family Care Clinic Field. The Robinson Construction and Eleanor Clark fields are utilized by the 5th and 6th grade division and 7th and 8th grade division. The 7th and 8th grade division also plays on the First State Community Bank field. Please use the field maps located on this site and at the soccer park to help you find your child's field. Q-What equipment does my child need? Shin Guards MUST be worn at all Games and Practices. Shin Guards must be covered at all times by socks. Players should wear soccer cleats. Cleats must be molded plastic cleats. No metal or Football cleats are allowed. Tennis shoes are allowed but we encourage players to wear cleats for their safety. Q-Should my daughter play in the coed or girls division? A-That decision is completely up to parents and their daughter. A girls division is offered in the 1st and 2nd grade and 3rd and 4th grade divisions. We wish to inform you that if your daughter does decide to play in the coed division in the 1st and 2nd grade or 3rd and 4th grade, she will be one of the few (if any) in the division and more than likely the only one on her team. In these age groups the majority of the girls play in the girls divisions. Q-What divisions are offered in the league? A-Divisions are based off of the child's grade that school year. There is Pre-K (must be 4 by March 1st for the spring season and by August 1 for the fall season), Kindergarten Coed, 1st and 2nd grade coed, 1st and 2nd grade girls, 3rd and 4th grade coed, 3rd and 4th grade girls, 5th and 6th grade coed, and 7th and 8th grade coed. Girls play in the coed division in grade 5th and above. We will offer a Kindergarten Girls division if there is enough interest. A-All-Stars is a competitive season following the recreational season. Players from each team are voted on by coaches within their division, based on their performance, attitude, teamwork, and willingness to play in that season. If a player receives enough votes they will be asked to be on an All-Star team. There are 4 All-Star tournaments offered each season (including one in Perryville). If your child is interested in being an All-Star player we invite you to notify your child's coach. Q-My child doesn't want to play anymore. Can we get a refund? A-Refunds will not be given after children have been placed on teams. Q-Can I request my child to be placed on a specific team or with a specific coach or another player? A-Any requests for a child to be on a specific team or with another specified player (other than a sibling) will be taken to the board for consideration. Q-How many kids play during a game? • A minimum of 7 players (5th through 8th grade) & 5 players (K through 4th). A team shall forfeit the game if the minimum number of players cannot be fielded within 5 minutes of the scheduled start time. If both teams agree to continue playing, the opposing team shall only play 1 player above the “short” team. Q-When will I get my child's jersey/shirt? A-Team shirt's will be picked up by the coaches only a few days prior to the start of the season. Generally coaches will try to have the shirts to the players at the last practice before the first game but sometimes it does happen that they have to be given out at the first game. Q-Does my child have to live in Perryville to play in the league? A-No. We welcome all children who want to play to do so! Q-When will the schedule be available? A-Schedules take a lot of time to prepare as we try to do our best to work around school sports as well as not schedule head coaches to have games in different divisions at the same time. We try to have schedules posted online 1-2 weeks before games start. Games start in the beginning of March in the Spring and mid-August in the fall. A-The Perryville Optimist Organization has a Perryville Optimist Soccer League Board comprised of volunteers who devote a lot of time and effort into providing an outstanding league for our area youth. You can find a list of board members on our website. Q-Who do I contact if I need information or have a question? A-You can email any of the board members listed on the website to help you. The POSL is not run by the City of Perryville therefore neither them nor the Perry Park Center are able to answer the majority of your questions. They do allow us to have registration forms dropped off at their facility but they do not know anything about schedules, teams, rainouts/make-ups, etc. Please forward your questions to one of the POSL board members.